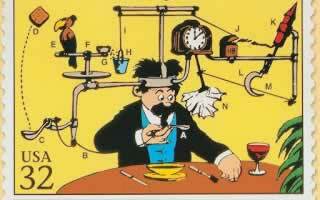 Judge Leon made headlines during the trial when he questioned whether a key Justice Department theory, backed by a well-known testifying-expert economist, was a Rube Goldberg contraption: "a machine intentionally designed to perform a simple task in an indirect and over-complicated fashion." The UK equivalent of this is a Heath Robinson contraption: "any unnecessarily complex and implausible contrivance." The Dane Robert Strom Peterson was similarly creative with "comic drawings of machines that perform very simple tasks through an unnecessarily complex and usually humorous series of actions."